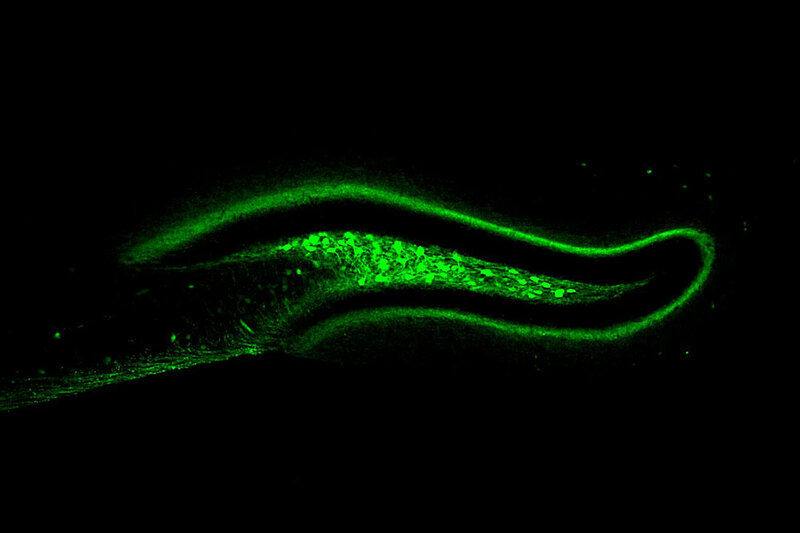 Activation of hD2R neurons, pictured here, prompts mice to decrease their food intake. Building on this research, Estefania Azevedo, a postdoctoral associate in the lab of Jeffrey M. Friedman, recently identified a group of hippocampal cells, known as hD2R neurons, that become active whenever a mouse is fed. Collaborating with Paul Greengard, the Vincent Astor Professor, and Jia Cheng, a postdoctoral associate in his lab, the researchers also found that when these neurons were stimulated, mice ate less; and when they were silenced, they ate more. In short, hD2R neurons respond to the presence of food by deterring animals from eating that food. In the wild, you can’t eat unless you know where to find food. Fortunately, brains are quite good at remembering the location of past meals: When an animal encounters sustenance in a particular locale, it makes a mental connection between the place and the food. To test how hD2R cells might affect these connections, Friedman and Azevedo stimulated the neurons as mice wandered around a food-filled environment. This intervention, they found, made mice less likely to return to the area in which food was previously located—suggesting that hDR2 activation somehow diminishes meal-related memories. Further experiments showed that hD2R neurons receive input from the entorhinal cortex, which processes sensory information, and send output to the septum, which is involved in feeding. The first to identify this brain circuit, the researchers conclude that the neurons serve as a regulatory checkpoint between sensing food and eating food. Within the oldest part of the brain, scientists have found cells in charge of controlling appetite and eating. The discovery could revitalize efforts to develop drugs for obesity that make us less hungry.